Mary Coffin Starbuck was one of the earliest Quaker women who helped settle Nantucket Island in Massachusetts. Okay, so there are more than just a couple of people Fisher accounted for in her book, but she gave a totally plausible and well-rounded character of Mary Coffin Starbuck with what information she had gathered on the lady. What was interesting to me about Fisher's book is that while the storyline is fictional, some of the people in it were not. While I won't spoil the book for anyone by any means I want to add on Mary Coffin never married one Captain Phineas Foulger. He simply didn't exist. If he did I haven't found any kind of information on him. But of the people who settled Nantucket, Massachusetts I have found the few people I mentioned already had indeed been a part of early Massachusetts history. Suzanne does a great job in telling a story. She weaves together bits of history that are real into this Christian, romance novel with such delicate ease that would make the reader think it was a Jane Austen book. Again, that is just my opinion, but as you read the book think on how close the ideas of preconceived notions we all have about others and in how we all end up in the situations we do. 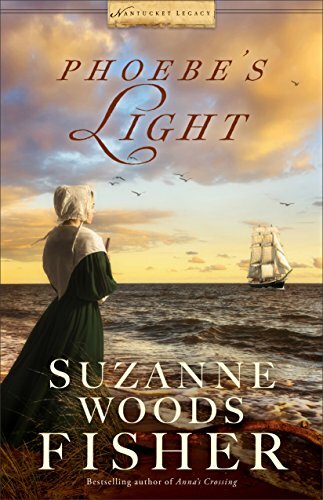 It is a wonderful book Suzanne Woods Fisher writes. It didn't seem too slowly paced or an overly fast read, but if you wanted to read the book as I did--in one day--it can be done. It's such a wonderful book, in my opinion, that Fisher has written I actually plan on keeping for my personal library I have going on. I received this book from Revell for my honest feedback. This review is fully my opinion and not based on anything anyone else has said.